← Phew – what a scorcher! Unless you are living in a cave, you probably know by now that Spain beat Italy 4-0 in the final of Euro 2012, last night. As you might imagine, there were lots of celebrations after the game. Beating drums, car- horns, fireworks and a fair few choruses of “Campeones!” ringing out until the early hours of this morning. How the Spanish love to party! It´s great to have a feel-good story amidst all the doom-and-gloom of the current financial crisis. 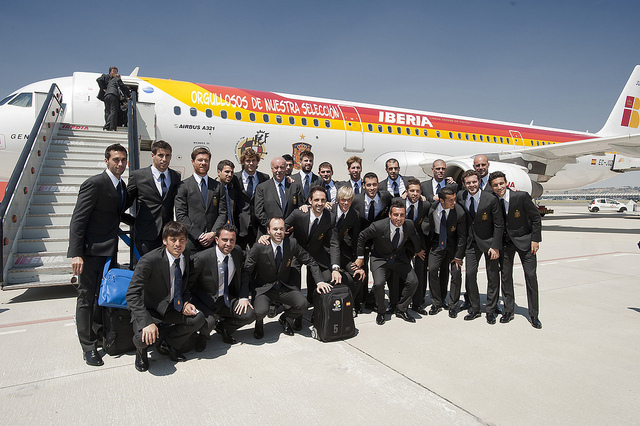 Well done Spain – worthy winners! Photographs I love … and why! This entry was tagged bailout, Euro 2012, football, Spain. Bookmark the permalink. We were in Madrid during soccer finals a couple years ago, and it was wild in the streets! You probably mean during the World Cup Finals two years ago when Spain won. Yes – everywhere went wild then too! Yes it was – and the atmosphere was electric, as you might imagine, here in Spain! What a fantastic game it was!! I agree, the Spanish need something to lift their spirits right now, and as a nation of sports lovers, this was a fantastic result!